Fish Curry looks so simple but is actually really hard to get right. I can promise you this recipe works. So many chefs don’t tell you to marinade the fish. Madness! You end up with a delicious spicy sauce and fish that tastes of.. well, just fish. Trust me, a tiny bit of prep will make all the difference. Also, blending the masala in the pan or in a blender makes the dish look very professional too. This should serve 4 people. Try it with lemon rice or with roti. Make a few light cuts in the fish to let the marinade seep in. 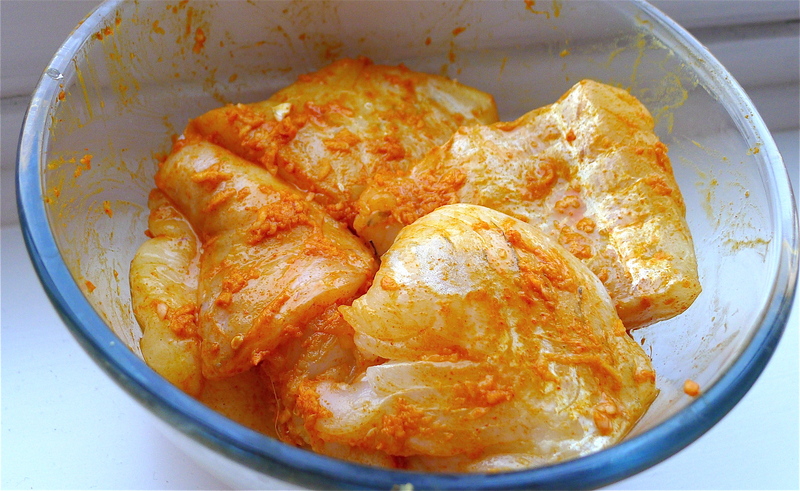 Combine the marinade ingredients and add the fish. Mix well, ensuring all the fish is covered. Cover and refrigerate for at least 30 mins, but overnight is best. Heat the oil in the pan, add the onion and brown. Then add the garlic, and if using, the green chillies too. Mix for a few minutes til softened. 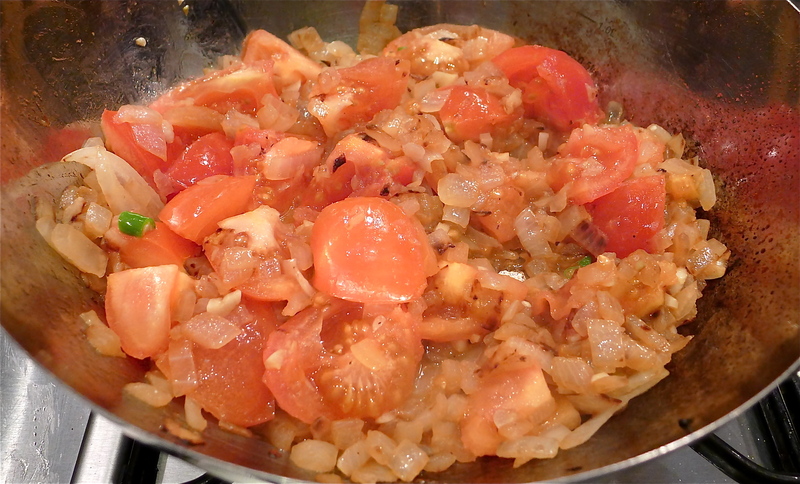 Add tomatoes, cook until soft, around 10 mins. Then add the spices, and the salt, and mix for 5 mins. At this point, add a bit of water to get the desired consistency, about 200 ml or half a mug. Cook on a medium heat for ten minutes, so the spices cook through. You can also use a hand blender in the pan to smooth out the masala if you wish. 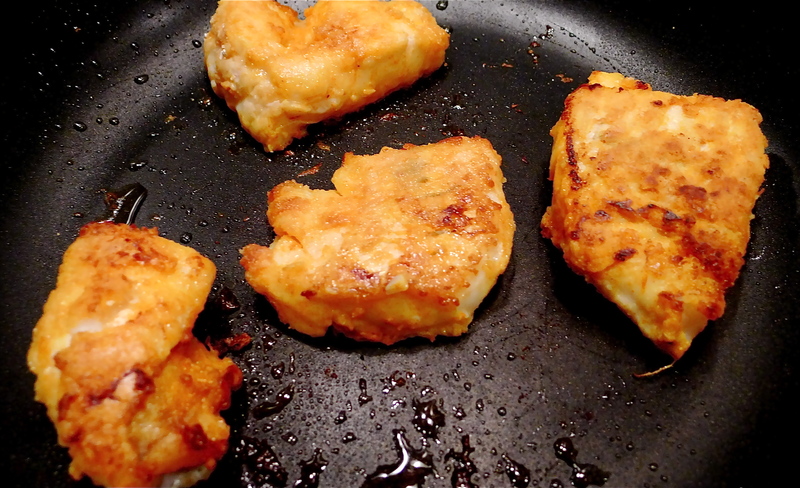 Lightly coat the marinated fish in the gram flour and shallow fry in batches, 5 minutes on each side. When cooked, drain oil off on kitchen paper and add carefully to the masala. Combine. Add 1 tbsp of lemon juice at the end, scatter the coriander, serve. Wow this is good! Watch us make it – click the video below.. I only came across this website today, and didn’t have any fish so I made it for dinner tonight with chicken. It was so tasty, quick and easy. My husband who thinks he is the curry cook in the family was also impressed. I will try with fish next time. Brilliant; really tasty & easy to follow. Only thing i’d change is the hand blender comment. Had to pour sauce into bowl to blend. Tried in pan but blender sent half of it around kitchen. Quite simply the best curry I have ever made. 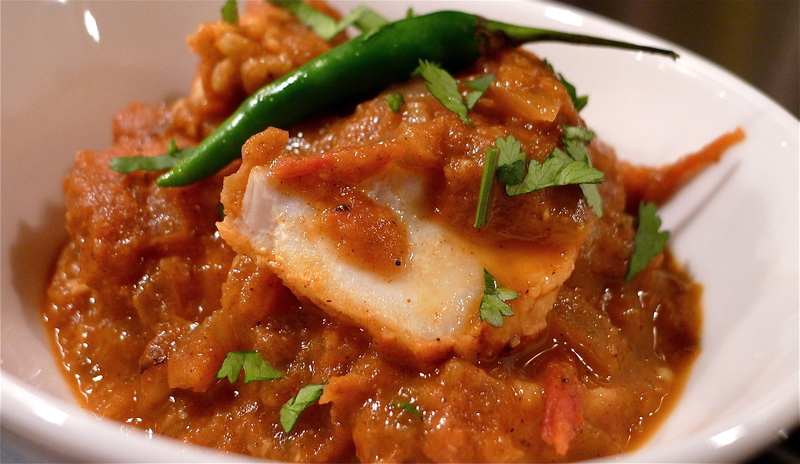 I have been cooking Fish Curry using Monkfish on my AGA for the last few weekends. My Husband and I think it is amazing! I have also cooked the Dahl and the Saag also the cumin rice which were all fabulous. We have stopped ordering take out food as I am so enjoying cooking the food and find it very relaxing I am looking forward to trying cooking the other recipes too. Healthier food which tastes amazing…and not full of oil!